The Proctor Creek Basin of Atlanta Georgia originates in downtown Atlanta and extends westward toward the Chattahoochee River. The Proctor Creek/North Avenue (PNA) watershed, headwaters of the Proctor Creek Basin, sits within walking distance of downtown Atlanta and is near the Georgia Aquarium, the Georgia Dome, Georgia World Congress Center, Philip Arena, Sam Nun Federal Building, and the New Falcons Stadium. In 1927, a combined sewer system was constructed in the PNA watershed to contain both raw sewage and stormwater flow. During wet weather, the mixture of stormwater and sewage (combine sewage) was conveyed to Proctor Creek. 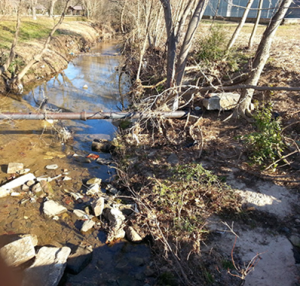 Over time, the discharge of combined sewage to the Creek has severely degraded its water quality. Neighborhoods located within the footprint of the PNA watershed are low income, predominantly African-American, and have been plagued by consistent stormwater and combined sewage flooding. In 2014 the Atlanta based non-profit organization Environmental Community Action Inc. (ECO-Action) received $60,000 from the Environmental Protection Agency’s urban waters fund to address flooding and water quality issues in the neighborhoods that experience flooding and water quality issues. ECO-Action’s initiative focuses on advancing the use of green infrastructure on Atlanta University Center (AUC) campuses, which are the sources of much of the contaminated runoff that negatively impacts adjacent neighborhoods at lower elevations. There are many intended outcomes of the project that include bringing academics together with leaders of underserved communities to better understand the extent and impact of sewage and stormwater flows from the higher-elevation Atlanta University Center campuses on the downstream, residential communities. Community priorities include mitigating and eliminating flooding, creating aesthetically pleasing and usable. While ECO-Action serves as the lead for the project there are many partners working together to address stormwater and combined sewer overflow impact on Proctor Creek. These partners include: Clark Atlanta University, the West Atlanta Watershed Alliance, Metropolitan Atlanta Urban Watershed Institute, Community Improvement Association and the Proctor Creek Stewardship Council.Residents of the English Avenue and Vine City neighborhoods, students at Spelman College and Clark Atlanta University, in addition to faculty and staff at these institutions are all being engaged in the effort to improve water quality in Proctor Creek and to help reduce the burden of flooding felt in these vulnerable neighborhoods.Community forums are being held which are designed to provide a direct learning exchange between community residents and the staff, faculty, and students of Clark Atlanta University (CAU) and Spellman College. So far one community forum has been held. It was a successful start to the series of forums that represent an intentional design to foster interaction between the academic community and local residents. Two more forums will be held ultimately leading up to the 2016 conference on green infrastructure. Service learning projects are an option for students who are interested in green infrastructure and who want to make contributions to the downstream communities. Students are not only developing a deeper understanding of green infrastructure, but they have the opportunity to create conceptual projects that have the potential to be implemented at the AUC to solve flooding problems in English Avenue and Vine City. Green infrastructure concepts and principals are being infused into the Clark Atlanta University dual engineering courses. This marks a milestone in the efforts led by ECO-Action to increase awareness among faculty, staff, and students about the importance of green infrastructure and the type of positive impacts these practices and principals can have at a local level. The relationships formed through this work are helping create a more informed public at both the neighborhood level and at the academic level. Residents, faculty, staff, and environmental clubs at CAU and Spelman are regularly planning together. They are devoted to the idea that residents should have access to a cleaner, greener Proctor Creek and they are helping build community-wide support for green infrastructure initiatives that will improve conditions in downstream neighborhoods.